There’re four ways in which the Orange really shines. 1. It’s rugged. The whole thing is completely waterproof — like, use-it-underwater waterproof. The unit is sealed, and there’s a rubber gasket that fits over the outlet. I’m not sure I’d ever be in a positon to have to generate solar power underwater, but I’m sure there are some whale researchers somewhere who are going to go nuts over this capability. We did actually submerge the Orange in about a foot of water for a while just to test this, and it passed. It’s also shock proof, dirt proof and any other kind of proof that matters in the outdoors (note: not tested for bear-proofness). 2. It’s got a massive battery. The panel is stuffed with an enormous 20Wh, 5,400 mAh battery. For perspective, that’s 3.5 times the capacity of an iPhone 4 battery, or about 0.75 times the capacity of an iPad 2’s battery. Does this translate into, say, being able to fill the iPad up three quarters when charging from absolutely dead? Not quite — we reached about 60 percent on the iPad (Joos says this is because the iPad is not very efficient at charging) — but it’s still one whopper of a battery. 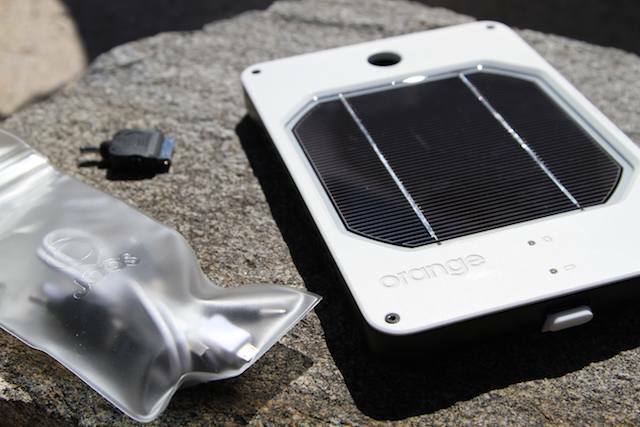 Because the battery is so large, and takes a such long time to charge under the sun — we clocked about a five percent charge per hour — Joos recommends you begin your expedition with a fully charged Orange by using the supplied USB charging cable, then keep the battery topped off via the solar panel when out in the field. 3. It can charge an iPad. 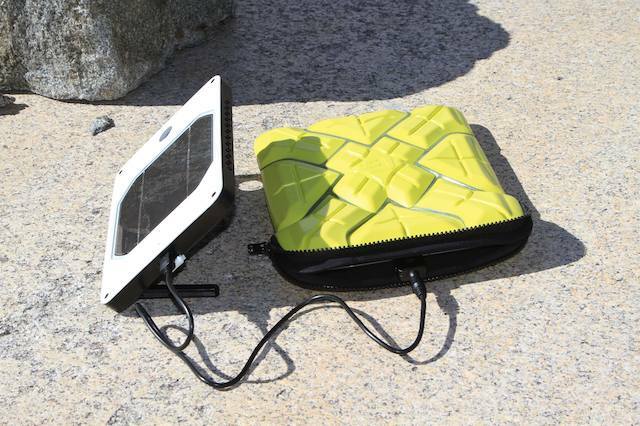 Not all solar chargers can, because — just like most charging solutions designed for the iPhone — they aren’t able to supply enough amps to charge the iPad. But the Orange can. Charging is also pretty straightforward: just plug one end of its special cable into the Orange, and attach one of six supplied adapters to the other end, plug in the hungry gadget and you’re good to go. 4. It uses high-grade components. The transparent cover over the photovoltaic cell is made from a non-yellowing, rugged urethane; the cell itself is a high-efficiency monocrystalline unit, and the cells are “connected in tandem,” which is supposed to give the Orange better performance in shaded areas; in fact, the Orange performed well in this respect, and kept charging even when in moderate shade. There’s other good stuff too — little details, like the waterproof drybag the connector and adapters come with, a big round slot in the panel’s housing for securing the unit with a cable lock, and two LEDs for charging status and battery level. There’s also a power management applet for the Mac — though, oddly, not one yet for the iPad (Joos says this is coming). The Orange takes forever and a day (almost literally) to charge. This is most likely due to its gigantor mega-battery, but still, it’d be nice if the thing took less than the almost two days to fully charge under the sun. The two LEDs — one that shows how well the Orange is charging by varying the speed of it’s blinks, and the other that displays charge level through the number of blinks — were difficult to see in direct sunlight. The output jack on the Orange is proprietary; lose the accessory cable and you’re stuck having to buy another from Orange — you can’t just plug in an Apple 30-pin connecter, as with some other solar chargers. 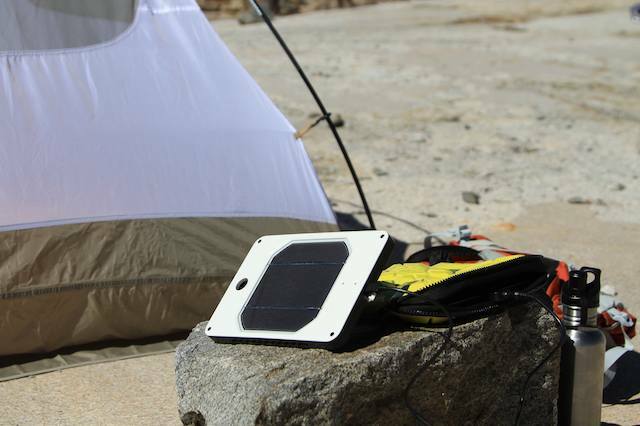 An expedition-quality solar panel that’ll keep your iPad juiced come hell or high water; certainly the latter, anyway.